Ku70 antibody recognizes X-ray repair cross-complementing protein 6, also known as CTC75, CTCBF, DNA repair protein XRCC6, or thyroid-lupus autoantigen . The antibody has been extensively validated for western blotting using whole cell lysates. 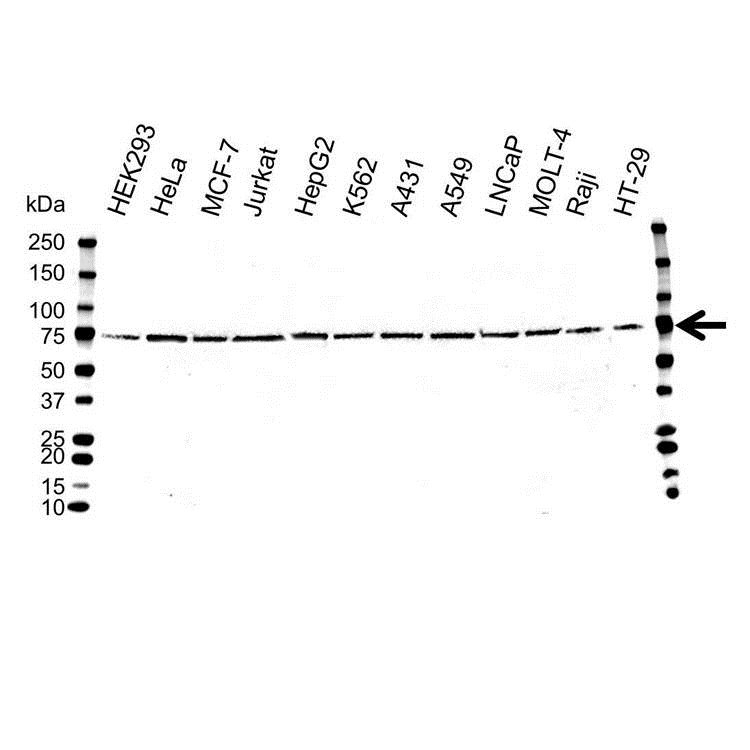 Human anti Human Ku70 antibody recognizes Human Ku70, also known as X-ray repair cross-complementing protein 6 or XRCC6. Ku70 is a 609 amino acid, nuclear protein involved in DNA damage repair. Ku70 contains a single Ku domain and a single SAP domain. Ku70 forms a heterodimer comprising of p70/p86 which acts as regulatory subunit of the DNA-dependent protein kinase complex DNA-PK by increasing the affinity of the catalytic subunit PRKDC to DNA. Research indicates that the Ku p70/p86 dimer is probably involved in stabilizing broken DNA ends and bringing them together (Walker et al. 2001). Human anti Human Ku70 antibody recognizes human Ku70 as a single band of ~70 kDa in multiple human cell line lysates by western blotting under reducing conditions. Anti Ku70 antibody detects a band of approximately 70 kDa in HeLa cell lysates.